Restaurant Uniforms Are the Perfect Fit | Ace Uniform Services, Inc. Restaurant uniforms create a professional place of business. Professional kitchens are unique in their culture, employees, and uniform needs. Your restaurant or catering business needs skilled employees that can properly handle stress, work incredibly long shifts, and do it all with a smile on their face (okay, and maybe some marinara smudged on their cheek). Getting restaurant uniforms for your kitchen staff and chef is a wonderful idea. Here are some of the ways that chef uniforms and kitchen staff uniforms can benefit you and your business. One of the biggest benefits of restaurant uniforms is the sense of harmony and belonging your staff will feel. Kitchen staff uniforms help your workers to feel valued and professional. They also help everyone to feel like a team, and increase the natural abilities of your staff to work together. You know that when your kitchen staff is working well together, you can avoid a room full of hungry diners grumbling about ticket wait times and a room full of disgruntled chefs worried about getting all of those meals out. Create a sense of teamwork in your kitchen staff by providing them all kitchen staff uniforms or chef uniforms. 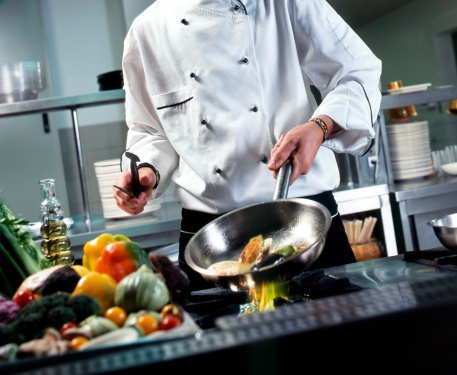 Chef uniforms and kitchen staff uniforms are incredibly practical for you and your staff. When your staff have uniforms provided for them through a rental service like Ace Uniform, they don’t have to worry about procuring expensive or hard to find items like chef jackets on their own. Spilled pesto all over your white kitchen staff uniform? Ace Uniform has the ability to provide you with a brand new uniform or a professionally cleaned version of the pesto-y one you previously wore. Beyond comfort and security, kitchen staff uniforms are an extension of your branding. Uniforms can be purchased in a wide range of styles and colors. Your logo could even be added or embroidered onto the chef jackets for an even bigger marketing boost! Kitchen staff uniforms can also be personalized and tailored to your restaurant’s personality, whether you’re a down home barbecue joint or an award-winning five star white napkin type of place. This entry was posted on Friday, August 5th, 2016	at 5:03 pm	. You can follow any responses to this entry through the RSS 2.0	feed. Both comments and pings are currently closed.